The auditions for Command Performance, Cascia's select vocal ensemble, are coming soon. 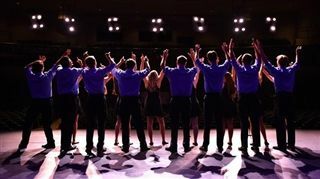 This 16-member group meets year round as an elective course and accepts members only through these once-a-year auditions. The auditions for next school year (2019-2020) will take place on March 5 and March 7. The auditions will be held after school in the Cascia upper school chorus room. 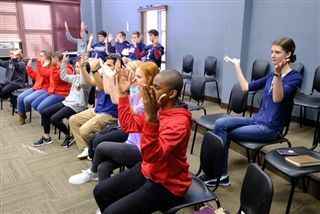 All students currently in grades 8-11, who have signed a contract to attend Cascia next year, are eligible to audition. Students do not need to come with any music prepared. Instead, students should expect to learn the music on March 5 between 3:00 pm and 4:15 pm. Then, on March 7, students will be asked to sing the music in various combinations with others, holding their specific part. The auditions on March 7 will begin at 3:00 pm and last until approximately 5:30 pm. Therefore, students should plan to attend both days of auditions. Any student with schedule conflicts should contact the director for an alternate audition time. However, all auditions must be completed by 8:00 pm on March 7. The ensemble member list will be posted on March 8. If you have any questions, please contact director Candy Coonfield at ccoonfield@gmail.com or call Cascia Hall at 918-746-2600 and ask for Candy Coonfield in the vocal music department.